The main character, Diana Bishop an alchemical history professor and witch with supposedly little magical powers that receives an ancient book, Ashmole 782 for her research. Once she realizes there is magic bound to the book and accidentally releases the magic, she returns the book to the stacks of the Oxford library. From this point you begin the journey into the lives and worlds of witches, vampires and daemons living among humans. 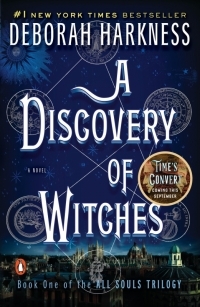 Matthew de Clermont, a biochemist and a neuroscientist and 1500-year-old vampire is the first creature to seek out Diana to convince her to retrieve the book that may contain the origin of all creatures. Matthew and Diana fall in love instantly and work together to retrieve Ashmole 782 as Diana learns to control her powers, all while keeping one step ahead of the Congregation who governs the creatures. Paranormal fans will be instantly hooked. If you have never read this genre before, this book series will open you up to whole new world of books out there. As a plus, A Discovery of Witches has been made into a TV Series in England. The series was released in the U.S. in January 2019 and is available to stream on Sundance Now and Shudder. I must confess that I binge watched the first season, and don’t know how I will wait until the next season is available.